Interesting question on the other forms that the stretch glass-making companies made from a single mold! I plan to cover this in a future Stretch Tuesday, but I’ll answer your questions about the candy jars. 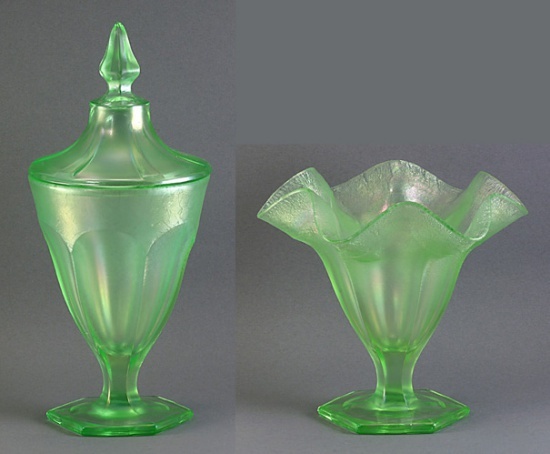 Basically, the glass companies realized that they could make a bunch of different items using one mold and Fenton and Northwood did this with their candy jar molds (except for the lid which required a separate mold). Both Northwood and Fenton use their covered bonbon bases to make three additional items, a cupped comport, a salver (a low dish with a raised rim) and a card tray. I’m including compiled image of these items in Northwood’s Russet (one of the colors Renée and I specialize in). Fenton made a 3/4-pound candy jar (#9) and the base was converted into a wide range of comports (flared, flared-cupped, two-sides-up or oval, square, crimped, card tray). I’m including a compiled image of some of these in Celeste Blue. You can imagine the bewildering array of these you could try to collect considering all the colors that Fenton used! Fenton also made a taller #835 candy jar that has a hexagonal base and the same number of external panels. The base of this jar was commonly flared and crimped into what Fenton identified as a #574 Parfait (or vase). This item is also found (rarely) in other shapes. I’m including a compiled image of the jar and parfait in Florentine Green. My fellow stretch glass collectors are always looking for these different forms and it really keeps us looking! In many respects, carnival and stretch collectors often get hooked on the little details! “We” chuckle about discussions on the number of grapes in a cluster, shape of the bee on Peacock pieces, crimping and foot shapes, but “we” obsess just as much on shapes (rolled rim, flared, cupped) and the different items made from the same mold! I had a friend some time ago wonder why I had so many Northwood Jade Blue bowls that were the same shape. I then proceeded to point out that each one had a different size foot, and was, thus, a different number in the Northwood catalogues! LOL!